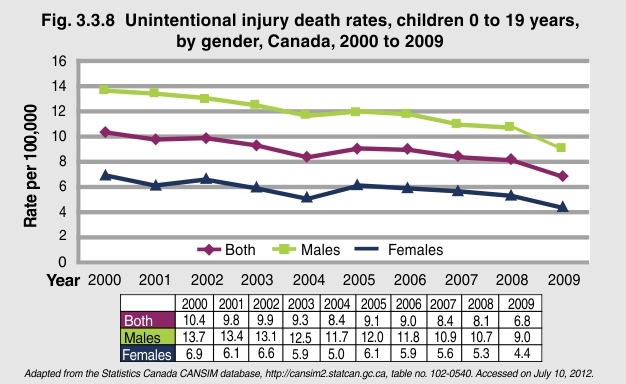 Unintentional injury deaths for males and females 0 to 19 years of age declined between 2000 and 2009. For males there was a 34% decline and for females there was 36% decline. Unintentional injuries are largely preventable. However, Canada ranks 18th out of 23 OECD countries in terms of injury mortality rates1. Common fatal injuries for children and youth include motor vehicle accidents, drowning, suffocation, strangulation, choking, pedestrian injuries, poisoning and falls. Deaths as a result of unintentional injuries are the tip of the iceberg. Unintentional injuries are a major public health problem, and the burden falls disproportionately on the most vulnerable in our society. Approximately 500 children and youth 0 to 19 years die as a result of unintentional injuries, and a further 21,000 are hospitalized every year. Many of those who survive are left with disabilities, both physical and emotional. For a child, this can mean a lifetime of living with the consequences of an injury. The stress on the child, their family and the health care system cannot be underestimated. The economic burden of unintentional injuries to children is substantial, costing Canadians $4 billion per year2. 1Safe Kids Canada (2011). The financial costs and prevention strategies of unintentional injuries. Accessed on May 28, 2012 at http://www.safekidscanada.ca/Professionals/Documents/33201-PublicSectorDigestInjuryPrevention.pdf. 2Safe Kids Canada. About Injuries. Accessed on Jule 6, 2012 at http://www.safekidscanada.ca/Professionals/Safety-Information/About-Injuries/Index.aspx .